The Management Assistance Group (MAG) is one of NPQ’s go-to sources of information about social justice movements. MAG works with a number of the networks that are moving some of this nation’s most difficult issues. MAG has come to believe there are five elements that are critical to advancing a thriving justice ecosystem. This concludes a special five-part series, in which MAG and NPQ invite you to contribute to the evolution of what these elements mean in practice. Gita Gulati-Partee, founder and president of OpenSource Leadership Strategies, asked that inconvenient question that many of us in “the business of change” face at some point: To what degree are our work and the ways we live our lives transforming the world, and to what degree are we unconsciously working against ourselves and our deepest vision? Reintroduced to “inner work” at a gathering of activists, Scott began to intentionally change his daily routine, weaving in practices that reconnected him to himself and the things most important to him. I used to wake up and immediately look at my cell phone for emails and news. Now I don’t look at my cell phone for the first 30 minutes of the day. For 15 minutes, I stay quiet and notice what’s in my head and focus on my breathing. I let myself come to alertness that way. Going to bed used to be all about social media and email. Now, I’ve turned that off. I focus on gratitude as I go to bed. I do that with my kids too and it has changed how they go to bed. These practices also began to have a profound impact on his work. Scott and Gita’s reflections speak to deeply human desires and needs. A need for human connection and relationship—connection to ourselves and with one another. A desire in our work for synergistic vision and movement, within and across our organizations. A desire for meaning and impact. Increasing our synergy, alignment, and collective strategy and action, including healing rifts inside ourselves, our organizations, and our networks and movements. As human beings, we all want these things. Scott, Gita, and others are helping us see how essential inner work and the practices that support it are, both for our own wellbeing and for our ability to do the “outer work” of social transformation and justice. 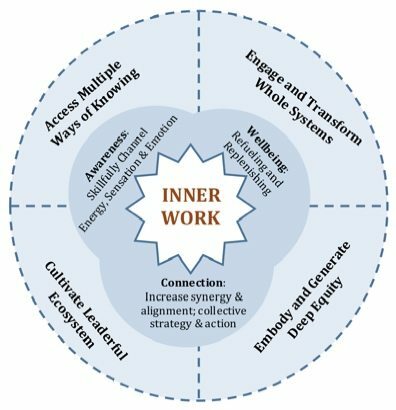 In the context of generating thriving justice ecosystems, inner work may be one of the least discussed but most essential elements. 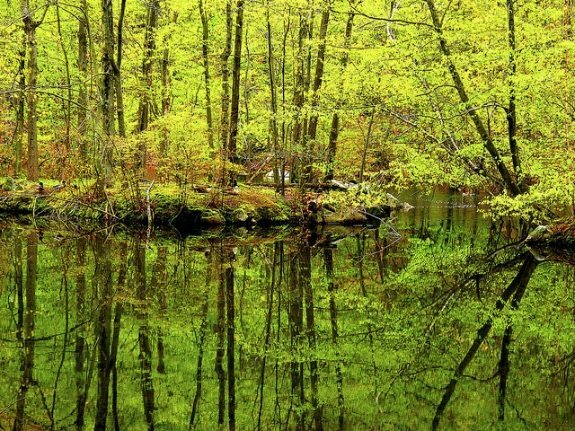 An ecosystem depends on the strength, vitality, and connection between its members. Like the cells in a body or the trees in a forest, the wellbeing and agency of the whole fundamentally depends on the wellbeing of its members. Similarly, our ability to create meaningful change as an “ecosystem” depends on our ability to embody and reflect the transformation we wish to see inside ourselves at the same time we embody it in the systems around us. This relationship between inner and outer change is generative. The more we nurture and experience change in one, the more we long for and believe it can be so in the other. Inner work also helps us to generate the qualities and conditions necessary for other essential elements of transformative systems change, which Management Assistance Group (MAG) talks about as including: accessing multiple ways of knowing, embodying deep equity, influencing complex systems, and nurturing leaderful ecosystems. The deep connection between inner and outer work has taken on new urgency for us in the weeks following Donald Trump’s election. We see the need for deep change all around us—change that transcends binaries, heals hearts and minds, and transforms systems and structures—but how do we get there? We are finding that a primary key to lasting social transformation and justice may actually be our own inner work. 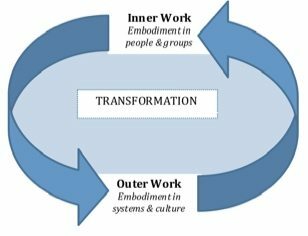 We share this article to help the field open and deepen its dialogue, understanding, and sharing of approaches to inner work—both the individual practices that support transformation, sustenance, and healing, and the group practices that lead to clarity of purpose, deepened alignment, healthier relationships, more powerful strategy, and sustainability for the long haul of social change—and its relationship to social transformation. By “practice,” we mean the conscious ongoing use of tools, techniques, and traditions that connect us back to our source and core essence, to our motivation, to each other, to the world, and to our deepest purpose for our work and being on the planet. Inner work practice is the “work” we do within ourselves and within our in our organizations, movements, networks, boardrooms, meeting rooms, community centers, spiritual centers, and offices to embody ways of being that align with and generate the world we long for. These practices help us ground and anchor so deeply in our core being (including purpose, commitments, values and other areas), that the deeper our practice becomes, the less likely it is possible for us to be shaken out of it, no matter the outer conditions or circumstances. Individuals can use a variety of personal inner work practices, such as hiking, gardening, jogging, artistic endeavors, dancing, singing, meditation, swimming, prayer, ceremony, yoga, or martial arts to renew, ground, and find connection in themselves. These practices may be silent, loud, physical, reflective, artistic, ceremonial, or any number of other approaches. Groups (a team, organization, community, network, alliance, etc.) can also use collective practices to ground themselves in their shared purpose, develop culture and structures that reflect their core values, and increase their alignment, synergy, and impact. Some in the field are beginning to experience and name significant impacts from integrating individual and group practice, including more patience with ourselves and others, more resilience in the face of adversity, greater awareness and compassion in our perception, the ability to hold multiple perspectives, and readiness to partner with others across differences. These results help us to know that whatever our practices are, they are yielding positive fruit. In our own experience, regular practice supports us to show up so deeply, so vividly, so rigorously, that we can actually feel and experience ourselves and one another in ways that inform thoughtful reflection, compassionate deliberation, good choices, and collective efforts that benefit the whole. This deeper clarity, awareness, and capacity helps us do our work in that we are able to regenerate our spirits and relationships even in the midst of competing demands, time pressures, structural, political and relational challenges. By dedicating time and resources to the inner lives, wellbeing, and connections between workers, OUR Walmart also generated a powerful, palpable experience of the alternative culture that workers were fighting for—a culture and way of being that centered human dignity, mutual support, respect, and interdependence. This enabled OUR Walmart to not only weather some very hard moments in their development but also come out stronger with deeper sense of purpose, diversified leadership, and equity. Similarly, Forward Together’s emergence as an inspiring cross-movement leader for reproductive and gender justice has everything to do with the inner work practices they adopted years ago as a group. They began their inner work practice at a time of crisis, when they were a local reproductive health organization focused on Asian communities in Oakland. In this period, Forward Together collaborated with Norma Wong of the Institute for Applied Zen to develop Forward Stance, a mind-body practice that helps activists step fully into leadership, build powerful organizations and align movements. Forward Stance practice “provided us with ‘a powerful way to learn and gain new insight through physical movement and by reconnecting our bodies with our minds,’”5 says executive director Eveline Shen. These types of collaborations, between nonprofits and inner work practitioners, are increasing. Other examples include the National Domestic Workers Alliance and BOLD who have worked with generative somatics to integrate practice into their leadership development, organizing and strategy work. One of MAG’s active learning questions is whether and to what degree deep inner work is possible in a group that has significant individual practice happening but no joint practice. We think some degree of meaningful group practice may be necessary in order for a group to pursue a depth of embodiment and alignment in its work together. A key ingredient for integrating inner work practice within an organization is setting up the structures and cultures that facilitate such pursuit. Many groups are also creating cultures that support a broad range of emotions in the work, value and prioritize relationships and connections both within the organization and with partners in the field, and integrate mind-body practice into all aspects of the work. These experiments, at their best, support groups to intentionally grow, develop, and align with their values. Our experience is that having a critical mass of people dedicated to their own deep inner work helps to model and support others in a group to do their own inner work. A combination of individual and joint practice supports groups to flower to their fullest extent. Moreover, greater inner work “bench strength” within an organization helps groups that are experiencing stress. Often, it is the depth of individual and joint inner work that enables groups to transform seemingly intractable cultural challenges and strife and move to new, healthier, and more sustainable places of functioning. My education and early positions in for-profit companies trained me to value productivity and efficiency and to see these values as the only way to achieve large impact. I had always been adverse to spirituality, religion, and touch-feely experiences, so I was in my comfort zone. Coming to Management Assistance Group opened up a whole new part of my being. With the support of Robin Katcher and Mark Leach, I was encouraged to slow down and to experience my emotions. We took time to learn about each other personally. These small acts were the first steps for me in a pathway to exploring inner work. At MAG, we have explored meditation, artistic practices, vision stance, and accountability around self-care. Outside of MAG, I engage in heart-circles with my community of activists and in deepening my connection with my partner. In all of these things, I have seen the power of inner work to sustain and fuel my hope, particularly in these times of rage and grief, and to help me see group dynamics in new ways that improve outcomes for clients. Exploring inner work may lead to questions about how much change we want and what we are willing to do to get it. To tackle these questions, nonprofit consultant and former foundation president Gayle Williams talks about “normalizing the shadow.” The shadow refers to the parts of our selves, our organizations, and our networks that are difficult to look at or even name, even though they are often quite similar across communities and individuals. Shadows can be as simple as an unmet desire to be recognized and as deep as our fears of existence. Suppressed, our shadows often get in the way of us being our most powerful, authentic selves. Williams speaks about the need to “make it safe to be human together” so that looking at our “shadows” is not taboo or avoided. Addressing our personal inner life can be more difficult than addressing the collective shadow(s). But not addressing these shadows compassionately and directly can stall or limit the depth of the collective embodiment we are seeking to advance our work. While inner work is in some ways basic—our perspective is that it’s innate to every person, deep down—some of it may also require fairly significant training, practice, experienced mentoring, containers for safer exploration, etc., in order to undertake skillfully and successfully. Some practices (particularly those developed in sacred contexts and translated to secular ones) are often only appropriately undertaken with guidance, while others can be pursued on one’s own. The greatest benefit we have found comes with sustained practice over time, and this depth may require guides and support along the way to achieve. Possibilities, routes, options, and pathways all seem more visible and possible as a result of inner work and the healthy, sustainable connections and relationships Centering our work in core purpose and deepening connections are also critical to complex system change. This centering provides a key compass with which to navigate choices in what can sometimes feel like an overwhelming array of data, players, and analytics. Embodied, connected navigation also supports organizations in developing a hunger for ecosystem change and equity. Inner work awakens our awareness that something else, something perhaps quite radical and liberating, is possible, and it nourishes the appetite and relationships (in combination with appropriate structures, systems and processes) to achieve it. When inner work is deeply embodied in the individual and collective life of those working for social transformation, there can be resilience at the group level so that when natural bumps or boulders in the journey arise, we don’t give up. Instead, we stay the course, course-correct, or shore up our reserves and capacity. We celebrate and introduce play, creativity, and lightness into our efforts. We remember the purpose, meaning, and inspiration behind what we’re doing, and it buoys us to keep going. This article was inspired in part by multiple conversations with our long-time colleagues and collaborators at Movement Strategy Center, Taj James, Mimi Ho and Julie Quiroz and their visionary work on the Practices of Transformative Movements. They are exceptional agents of change, galvanizing and weaving various parts of the non-profit and community organizing fields. Zimmerman, K., N. Pathikonda, B. Salgado and T. James. (2010). Out of the Spiritual Closet: Organizers Transforming the Practice of Social Justice. Movement Strategy Center: Oakland, CA. “It’s Time for Healing Centered Youth Organizing,” MSC blog, Let’s Talk, 2014. Zimmerman, K. and J. Quiroz. (2015). Love With Power: Practicing Transformation for Social Justice, Movement Strategy Center; Oakland, CA. Leach, M. and L. Mazur. (Fall/Winter 2013). “Creating Culture: Promising Practices of Successful Movement Networks.” Nonprofit Quarterly. p.11. “Stop Strip Mining Our Souls; Let’s Compost Nonprofit Culture,” MSC blog, Let’s Talk, 2014. “Three Practices for Movement Builders in the New Year,” MSC blog, Let’s Talk, 2015. Thank you for reading this series, “Five Elements of a Thriving Justice Ecosystem.” If you’d like to return to the start, click here. Sheryl Petty is a Senior Consultant at Management Assistance Group and has worked in equity, organizational development and systems change for over 20 years. She also has a long history of supporting individuals and groups in developing inner work practices, mindfulness and socio-emotional competencies as core capacities. Kristen Zimmerman is an independent consultant, writer, and graphic artist. A co-founder of the Movement Strategy Center, her work focuses on building communities of purpose rooted in transformative practice, creativity, strategic thinking, and movement building. Mark Leach is a senior consultant at the Management Assistance Group and focuses on issues such as strategy, leadership development and transition, and issues of diversity and inclusion in organizations.